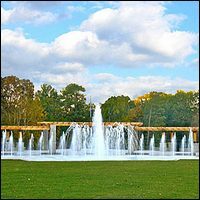 Piedmont Park, Atlanta’s “Common Ground” since 1904, is located approximately two miles northeast of downtown Atlanta. The park runs along 10th Street (a block west of 10th and Monroe Avenue to a block east of 10th and Piedmont Avenue) and Piedmont Avenue (12th and Piedmont to just before 15th and Piedmont) in midtown Atlanta. The park is open daily from 6 a.m. until 11 p.m. Parking: Parking in and around the park is very limited. Park visitors are strongly encouraged to utilize public transportation. If you drive, you may wish to download the map showing the route to the new SAGE Parking Facility. The parking facility is operated by the Atlanta Botanical Garden and is available for visitors to Piedmont Park and the Garden. MARTA: Take the Red/Gold Line to the Midtown Station. Walk east on Peachtree Place toward Cypress Street. Turn left at Peachtree Street. Next turn right at 10th Street and then left on Piedmont Avenue to reach the park.